Timber Trail sounds like something out of the Old West, but in Breckenridge it is a newer outpost of wooded lots where high-end homes have been custom built, just one ski-run pitch below the base of Peak 8. The Timber Trail homes for sale lie in a neighborhood first, and a ski-in home second. 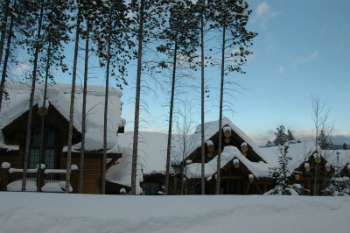 Timber Trail is a beautiful neighborhood, and a great place for a ski home. It’s right off Four O’clock Run, near the top of this run, so you can ski home from Peak 8 – anytime of day, and head back onto the mountain by taking 4 O’clock Run downhill to the Snowflake Lift. More about Timber Trail can be read about the stunning single-family homes found in this subdivision, or browse the active Timber Trail real estate listings below. The first home was built in the Timber Trail subdivision in 2004, and all are more than 4,000 square feet and each is unique. Many have garages larger than a small condo. The lots are large, but under an acre. The neighborhood is within town limits, and is governed by strict planning and zoning regulations that include maintaining trees and landscaping requirements, so these homes are very private. The architecture generally designed and built in Breckenridge in the 2000s has been a contemporary mountain style with lots of wood and stone on the exterior and exposed log-beams inside shown off by large windows. Sun counters the cold nearly every winter day in Breckenridge. The views are spectacular, whether they are of the Tenmile Range and the ski resort or across the valley. It's a five-minute drive from any Timber Trail home to the center of Breckenridge. Or, from up in the Timber Trail neighborhood, take a mile-long hike or ski - downhill - along Four O’clock Run. Size: 4781 (2010 basement) sq. ft. to 9536 sq. ft. 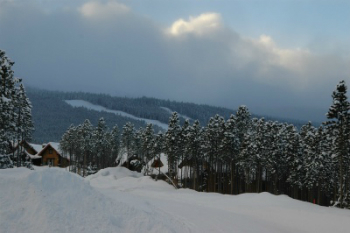 Amenities: close to the base of Peak 8, in town, on 4 O’clock run, views, near Breckenridge Nordic Center. From the center of Breckenridge (main stop light on Ski Hill Road) take Ski Hill Road to CR 708, or Timber Trail Drive, turn left onto this road and remain on it, the neighborhood is about one half mile south and to the end of the cul-de-sac. We are ready to help you find your dream home in Breckenridge and the surrounding Summit County community. Contact us today to get your journey started.